I'm extremely interested in learning all about the different kinds of alternative healing techniques. I have experienced many different kinds on my healing journey; massage therapy, homeopathy, reflexology, herbal, acupressure and acupuncture, etc. Acupuncture, for example, uses hair-thin needles on specific acupuncture points throughout the body to give relief to a multitude of different ailments. There are also different acupuncture and acupressure techniques a person can use-You can go to a certified professional for a session or you can use certain at-home aids like specialized mats and pillows. Thanks to Bed of Nails, I was able to chose the latter option and try out their specialized mats! "The origin of bed of nails is in Indian mysticism, and it is believed to have been around for thousands of years. Today it is "re-invented" in a more modern form, as a mattress with 8,820 non-toxic, 100% recycled, plastic spikes, harmless to the skin but with all the healing benefits of its legendary ancestor!" 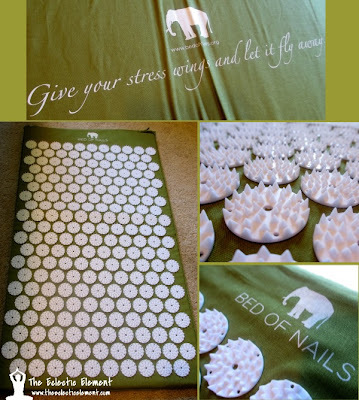 Bed of Nails is similar to acupuncture; the pressure of the rounded nails evenly distributed against a person's body and skin may help the body to release endorphins and oxytocin, which provide a sense of joy and energy along with calmness and relaxation. This product may also reduce the appearance of cellulite by stimulating blood flow to certain areas of the body and this can help break down the fat groupings that cause the cellulite appearance! For this review I was sent their Green Sun Bed of Nails Mat. As directed on the website, I do my best to bring out my mat everyday (sometimes twice a day) and use it for 5 to 10 minute intervals. The first time I used my mat I wasn't quite sure what to expect so I layed down on my back very carefully. Some people prefer to have skin-to-mat contact but for the first time I wore a t-shirt. The rows of round plastic spikes across the mat do look a little intimidating at first but they do NOT hurt! All you feel is slight pressure and possibly a wee little pinch if you choose to not wear anything between you and the spikes. The cushy foam of the mat combined with the spikes come together to make quite a unique feel-good experience, especially since your weight is evenly distributed across the mat regardless of which position you choose to use. I was simply astounded by the difference I saw with that first use! Like I said I wasn't quite sure what to expect but after I layed down on my mat and situated myself, it was like my whole body took a huge sigh of relief and continued to be completely and totally relaxed. I noticed the biggest difference after the 5 minutes were up; I got off my mat and was almost in a dream state I was so relaxed. In fact, I nearly fell right asleep! I've taken to using my mat right before I go to sleep and in the morning when I wake up because I notice that makes a huge positive difference in my day, both mentally and physically. Plus, when I get a little too overwhelmed or stressed, I take 5 to 10 minutes out of my day to lay on my mat and just be. I can honestly say Bed of Nails has definitely had a positive impact on my life since receiving it! If you're curious, you can check out the company's Testimonials and see what other praise people are giving these great products! Warning: Bed of Nails does come with sharp plastic spikes that can be potentially dangerous to people, children and or animals. Please be conscious when using this product and take proper precautions (keeping away from children and animals) when using and storing! Disclaimer: I was provided a product from Bed of Nails in order to facilitate this honest review. All opinions expressed above are 100% mine and mine alone unless otherwise stated. Please do your own research before committing to purchase a product or service as your opinions may vary. This sounds simply amazing! I have always wanted to try accupuncture, but this sounds a but less scary! Wow, that mat looks... painful. It's surprising, though, that you stressed that the spikes don't hurt. That's relieving, but it still looks intimidating. I'm glad that using the mat has been so beneficial to you, though. That's really great! I've never seen this before, looks neat! Well, you know me luvie I'll try anything once! With my back pain this would be an astonishing break through for me. I simply HAVE TO look into this. Thanks so much for sharing! HUGS. By the way, love your Post, and your thorough explanation of such a miraculous product. That is very cool! I never thought such thing ever existed!! Thank you for educating me about it!